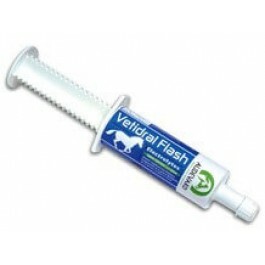 Vetidral Flash is a complementary feed formulated by AUDEVARD Laboratories. It is designed to provide horses with additional nutrition and electrolytes in the event of heavy perspiration. Horses perspire heavily during intense exercise and summer weather. This results in the loss of more than just water: they also lose electrolytes, which are essential to efficient biochemical exchanges within the body. It is therefore important to fully replace lost electrolytes through appropriate nutritional intake. The Vetidral Flash formula contains electrolytes in proportions identical to those found in sweat, in order to make up for losses. It also provides prebiotics to stimulate electrolyte replacement and absorption. Analytical constituents:Humidity 76,3%, crude protein 9%, crude fats 0%, crude ash 15,5%, crude cellulose 0%, sodium 4%, citric acid 5,2%. Daily allowance:Empty the contents of the syringe into the horse’s mouth. Administer for 1 to 3 days.